Hydrostatic testing is a process where components, such as piping or pressurized containers are tested for strength and leaks by filling the equipment with pressurized liquid. All Florida Fire Equipment is a fully licensed hydro testing facility. Hydrostatic testing works by filling the component with liquid until a specific pressure is reached. The hydro test pressure often exceeds the designed working pressure of the equipment, sometimes by over 150%, depending on the exact regulations and code requirements. The pressure is then held for a specific amount of time while we visually inspect the system for leaks. Hydrostatic testing is critical to ensure that your pressurized system is capable of maintaining pressure and will be ready to work when you need it. All Florida Fire Equipment is one of the largest DOT hydrostatic testing facilities in the Tampa area. We pride ourselves on our quick turnaround time and our attention to detail. 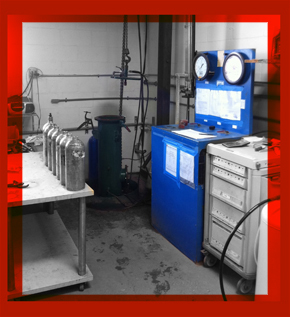 We have the ability to hydrostatic test almost all cylinders with a DOT number. There are several methods used in hydrostatic testing (water jacket testing and direct expansion are the most common), but most people are more interested in making sure their equipment is in good working order than understanding the process. If you are curious about how we accomplish our hydrostatic testing, your technician will be more than happy to explain each step to you as our people love to talk about what they do. Once the test has been completed, and your technician is satisfied that the equipment is in perfect condition, he or she will record the date and results of the test in our system to make sure that you are notified in advance when the next hydro test inspection is due. How often do I need to have my tanks hydro tested? You can check the testing requirements of your equipment by referring to the DOT sticker on your cylinder. All the information the tester needs is there including the serial number, manufacturer, and manufacture date. If you are uncertain about the testing requirements of your equipment, you can find more information on the DOT website, or just contact All Florida Fire Equipment and we can do the research for you. DOT-3AL gas cylinders must be tested every 5 years and have an unlimited life. DOT-3HT gas cylinders must be tested every 3 years and have a 24-year life. In the U.S. and Canada, organizations such as ASTM, and ASME specify the guidelines for the different types of pressure vessels.